If you ever plan to visit Chicago in the winter, know this: The city’s plows circumnavigate the south side, giving cursory attention to main thoroughfares and none to side streets. Each time it snows, the flakes pack down into ice sheets. Eventually, the snowbanks constrict two-lane streets into one-lane corridors. 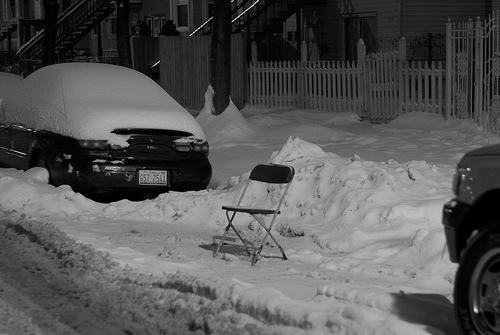 To cope, most residents adopt an every-man-for-himself tactic: Shovel out your parking spot, mark it with a lawn chair, and keep one eye on that lawn chair. But here’s the upshot: Ice graves. In our selfishness, we never lift a flake beyond our own vehicle; not a spec to the front, not a spec to the trunk. Walls of snow amass on three sides of each car, creating an ice-pack graveyard with one plot per car. One morning in winter 2009, I slipped into my Hyundai and stepped on the pedal. My car lurched against the wall of snow and slid back into place. I nailed the pedal again. Lurch, slide. Lurch, slide. When I smelled rubber, I knew things were bad — my plastic shovel snapped months ago. Glancing into the rear window, I noticed a car parked in the middle of the street. From it, a figure emerged. I could barely see him through the haze of exhaust. Then — CHOP CHOP CHOP — he railed against the ice-pack. I hopped out of my car and before I could say anything he said, “I’ll dig you out.” I balked. I couldn’t decline, but I had nothing to offer in return. With deft strikes, he cleared all three walls. I asked for his name and number so I could repay him. He held up a palm, gesturing no, and then slipped into his car and into the darkness. Serious-Gourmet.com paired this image with a story on The Lawn Chair Code. Nice guy. Did he find any of your clothes in the snow bank? Sadly, I grew up on a farm near a town of 1100 people in Northern Illinois. Life was boring except for the time we pushed over a outhouse and a town cop who looked like Broderick Crawford hauled us into the town jail. But my mom said that she had to go square dancing. So, there you have it. Nothing as exciting as stuffing clothes in a snow bank.